The word ‘taco‘ originated in the 18th century silver mines in Mexico. Back then, a taco was the paper used to wrap around gunpowder for small explosives. Founder, Glenn Bell, first opened the chain “Del Tacos,” a hot dog and taco franchise. He was the first to fry his taco shells in advance. Before then, they were fried on demand. They were the first fast food chain to have move tie-in promotions. In 1962, a tacos only cost 19 cents. Even though the 1990 Chihuahua was an advertising phenomenon, taco sales actually went down during that period. Taco Bell has tried to enter the Mexican market twice, failing both times, even after branding their food “American” food. 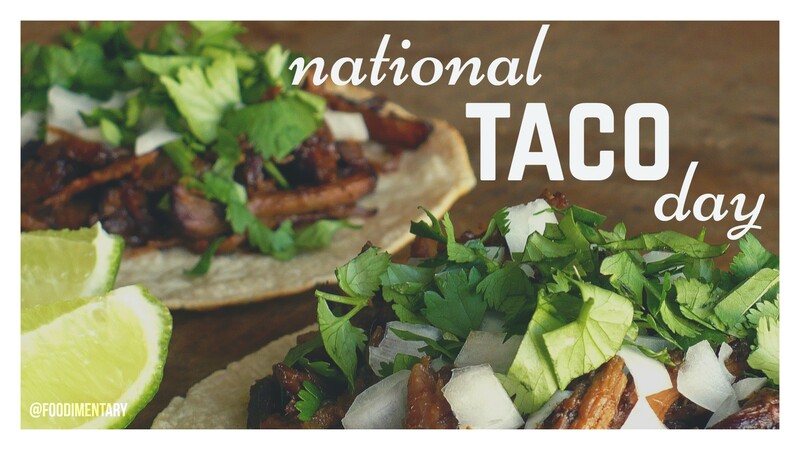 In 1914, the first recipes for tacos were put into an English cookbook. 1925 Teaching the theory of evolution became illegal in Tennessee. 1984 A section of Central Park is renamed ‘Strawberry Fields’ to honor John Lennon. 1994 Due to bad harvests, there is a shortage of Japanese grown rice. Japan’s Imperial Palace begins serving royal meals to the Emperor & Empress with rice grown in the U.S., China and Thailand. 1999 Bertrand Piccard and Brian Jones landed in the Egyptian desert, having completed the 1st ‘Around the World’ hot air balloon flight. According to the BBC, they carried fresh food, including bread, cheese and pre-cooked steaks to last for 6 or 7 days, after which they made due with dried foods such as cereals and powdered milk. The flight began in the Swiss Alps, took 19 days, 21 hours and 55 minutes, and covered 29,056 non-stop miles.